This recipe from Real Simple is my go-to for a quick healthy dinner. It’s so easy and tasty that I promise, anyone that tries one of these burgers will ask you for the recipe! 1. Heat broiler. In a large bowl, combine the turkey, zucchini, carrot, garlic, thyme, salt, pepper, and egg. Form the mixture into 4 patties. 2. Heat 1 tablespoon of the oil in a large skillet over medium heat. Cook the patties, turning once, until no pink remains, 4 to 5 minutes per side. 3. Meanwhile, place the bread on a baking sheet and brush with the remaining oil. Broil until golden brown and crisp, about 1 ½ minutes. 4. Transfer the bread to individual plates. Top with the lettuce and burgers. 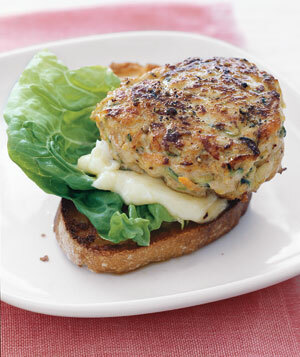 If desired, combine the mayonnaise and lemon juice and serve with the burgers. For extra zest, immediately after removing the bread from the oven, rub it with the cut side of a peeled, halved garlic clove.